Ah yes! I remember your post about this awhile ago. Yay for more memories. You sat by a sumo wrestler? That is awesome! One of our clients is a sake bar/restaurant so for months I was looking at sumo related things! Oh you are so lucky! I have been dreaming to go to Japan for so many years! Anything related to Japan perks my interest. Alea - I love going to sake bars/restaurants and eating Onigiri. I think you would really, really like this novel! You should get it. Diana - Japan is an interesting country, that's for sure! ooooh this book looks very interesting, I will have to add it to my "to buy" list. I actually plan on either studying abroad or at least visiting Japan while I am in school. I am learning to speak Japanese and my university actually has a lot of Japanese exchange students that we get to interact with. I had a similar experience in the two weeks I was in Japan. It was so great! And you really don't have to worry about walking down the street alone, I loved it there. Oh and I also ate shabu shabu, it was great! :D I saw some sumo wrestlers too but I unfortunately didn't get to sit next to one :) One of the hotels I stayed in had a sumo wrestling stadium across the street so we saw a bunch walking by every now and then. I also got a chance to go to a kareoke place it was really different. They all have little private rooms like the ones you went to. It was pretty cool especially when I got to see some drunk business type people walking to their room haha that was very funny! Oooh it's a paperback release, it's on the wishlist! That book looks like fun. 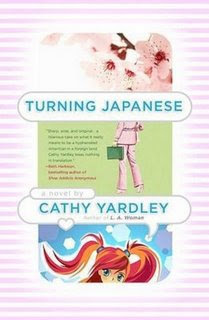 Wasn't there a song called "I think I'm turning Japanese." Our son spent some time in Japan after his junior year of high school and absolutely loved his time with a Japanese family. I'm jealous of all your travels. These are great memories. I don't know about the book, but I loved your remembrances! Wow, sounds like so much fun. I can't quite picture buying beer from a vending machine. The book sounds really cute! Great review. I love how they gave everyone in your class As. This sounds like a good book, and I enjoyed reading your memories from Japan. I think I might have to use "we part as friends" in the future. You have traveled far and have many cool stories! The books sounds good, but your adventures in Japan sound better! HA! Looks like a fun book! I love Japan and the small private karaoke rooms. Man, did I spend good many a night in those. Lady, when are you going to write these stories up into a set of travelogues? Now there's something I would love to read! Have you done nothing in life but travel and have fun and make the most of it? :) It sounds amazing! Turning Japanese looks great, I will have to check that out! Thanks! This looks like a fun read! loved your list!! If all goes as planned, I'll go to Japan next year's summer, when I'm 18. I'm really excited because it has been a long time since I want to go there. Of course, if my University has an exchange programme with Japan i'll aply for it! Loved this review...have to read this book. I was an exchange student in 1987 in Niigata. Loved your 13 things...again!!! I could so relate to your Japanese memories!! As always, great post! And I learned something new - I had to look up bosozoku. I loved reading all your Japanese memories. It sounds like it was the trip of a lifetime! Love your travel memory posts! I've never been to Asia, would definitely like to experience that someday. Maybe without the Spike Girls karaoke, though.